As a person who is interested in becoming properly trained to handle food in the state of California, you need to know what the California food handlers card is, the law that put it into effect, who needs one of these cards, and how to get it. What is the California Food Handler Card Law? accredited training provider. A food handler card obtained from any other source is not recognized as valid. As of June 1, 2011, the law states that employees must obtain their food handlers card within 30 days of their hire and renew their card every three years. Who Needs a California Food Handlers Card? A food handler card is required to be held by anyone who prepares, stores, or serves unpackaged food in a cooking or food preparation facility. A California food handlers card is required by anyone working in California who handles food, except for those food handlers in Riverside, San Bernardino, and San Diego counties. If you work in any of these counties, call the local health department for more information, as they have their own pre-existing training requirements. How is a California Food Handler Card Obtained? Food handlers have to pass a food handler training course and the corresponding exam with a score of at least 70% to receive their California food handler card. The training course typically lasts 2-3 hours and can be completed online. You can start and stop at your convenience, and once you pass the online exam, you can print your certification and food handlers card immediately. If you fail the test, you may, for a limited time, retest once for free. The California food handler card is required by law. Are you properly trained to handle food in the state of California? At Premier Food Safety, we have more than 35 years of training experience, four languages to choose from, the lowest prices in the state and a satisfaction guarantee. For all the training and knowledge you need to become certified, register with Premier Food Safety today. Learn more about the qualifications to work in the restaurant business by finding us on Facebook and Twitter. If you are interested in starting a food service career, you most likely must start at the bottom and work your way up the ladder. Here’s some advice about getting started in the food service industry and how to provide exceptional customer service once you have your foot in the door. Obtaining a food handlers card to prove your ability to work in a food service job should be the first thing on your to-do list. The law in California states that those new to food service careers must obtain their food handlers card within 30 days of being employed. Fortunately, training takes only 2-3 hours to complete and you can either print your card immediately after passing the exam or have it mailed to you within less than a week. 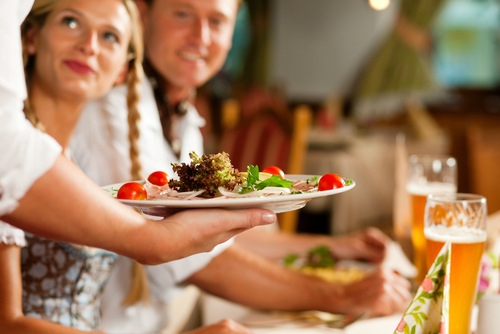 Once you have a food handlers card, you will still have to learn the ropes of your new food service job. You will need to learn how to speak with customers, become familiar with restaurant policies specific to your new job, learn the menu, and recognize how to use the computer system. 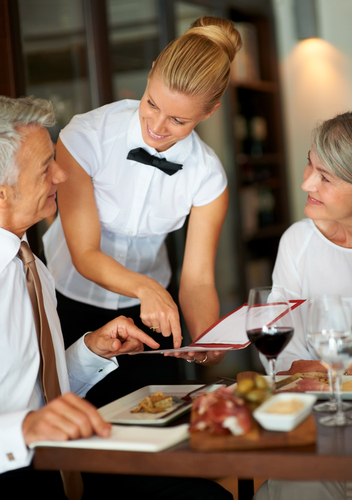 Once you know the ins and outs of working in a food service job, you need to learn customer service tactics. First and foremost, look professional. You represent the company you work for, and if you want to rise up the corporate ladder, you need to look the part. Always have a table prepared for the customer before it is presented. You want the guest to feel as if they are the first person of the night to sit at that table or booth. This goes hand in hand with a positive, caring disposition. Convey genuine interest by keeping a smile on your face at all times and paying close attention to anticipate your guests’ needs. This will make customers feel special and cared for. Finally, always have the daily specials in mind. It’s unprofessional to say you need to check with the kitchen and even worse to give the wrong response only to be corrected later. Are you properly trained for a food service career in the state of California? At Premier Food Safety, we have more than 35 years of training experience, four languages to choose from, the lowest prices in the state and a satisfaction guarantee. For all the training and knowledge you need to become certified, register with Premier Food Safety today. Learn more about the qualifications to work in the restaurant business by finding us on Facebook and Twitter. A food handlers course is needed to obtain your California food handlers card. The New California Food Handler Card law requires that anyone who prepares, stores, or serves food must have a food handlers card. Premier Food Safety is the ideal place to complete your training course for several reasons. Our online training option is convenient and can be completed from home, making it the preferred choice for many food handlers. We are so confident that you will pass the online exam the first time that we will let you retake the course at no extra charge, if needed. Once you pass, you receive your food handlers card online and can print it out immediately. If you are a manager looking to train a large group of employees at once, on-site instructor-led classes are available. Our private classes offer a hands-on experience delivered by food safety experts with extensive knowledge of instructional best practices. For more information or to request a quote, please call 800-676-3121. At Premier Food Safety, we have successfully trained and certified more than 75,000 food handlers in the past 35 years. If you want the best chance of passing your food handlers card exam, there’s no better place to turn to than Premier Food Safety. The California food handlers card is required by law. Are you properly trained to handle food in the state of California? At Premier Food Safety, we have more than 35 years of training experience, five exam languages to choose from, the lowest prices in the state and a satisfaction guarantee. For all the training and knowledge you need to become certified, register with Premier Food Safety today. Learn more about the qualifications to work in the restaurant business by finding us on Facebook and Twitter. A food handlers permit online is something everyone who prepares, serves, or stores food should think about obtaining. Of course, you don’t necessarily have to obtain your food handler permit from an online source, but an online training course is simply incredibly convenient and easy. Premier Food Safety offers such a course with more than 35 years of experience training over 75,000 people. Generally, the entire purpose of a food handler card law is to increase awareness of safe and proper food preparation to lessen the number of food-borne illnesses that occur in that state, city or county. Be aware that some counties may not require those who handle food to carry a permit. Always check with your local health department to make sure a food handler permit is required in your area before you enroll in a course or sign up to take the exam. The law usually dictates that food handlers new on the job must obtain their food handler permit within a specific period of time. Every state, or even county, has different rules on this matter. For example, Texas and California require you to secure your permit within 30 days of being hired as a food handler. Florida, on the other hand, gives new food handlers 60 days to obtain their permit. Whatever the law requires in your state or county, now is the best time to pursue your food handlers permit online, because once you get involved in your job, it’s easy to forget about legalities. Are you properly trained to handle food in your state? If you are in California, Texas or Florida, you can register with Premier Food Safety and get started today! Take the online course to quickly and conveniently get your food handlers permit online. Once you pass the exam that follows the 2- to 3-hour training course, you can immediately print out your permit and be good to go. At Premier Food Safety, we have over 35 years of training experience, five exam languages to choose from, the lowest prices and a satisfaction guarantee. Sign up for all the training and knowledge you need to become certified. Or learn more about qualifications to work in the restaurant business by joining us on Facebook and Twitter.